A postcard depicting an illustrated aerial view of Lake Geneva harbor, with Mont Blanc in the distance. The lake is located on the north side of the Alps and is shared by Switzerland and France. Gribble, Francis Henry. Lake Geneva and Its Literary Landmarks. Westminster: A. Constable & Co, 1901. Ardito, Stefano. Mont Blanc: Discovery and Conquest of the Giant of the Alps. Seattle, WA: The Mountaineers, 1997. 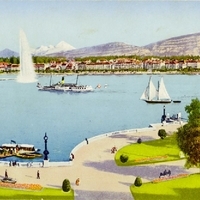 “Geneva Harbor and Mont-Blanc Postcard.” RICHES of Central Florida accessed April 21, 2019, https://richesmi.cah.ucf.edu/omeka/items/show/6661.